Epic Mountain Resort posted "no skiing" signs all over their base Friday. Most were promptly stolen or vandalized. Creative Commons photo. MTN. TOWN, USA — Saying conditions were never this good when skiing was still allowed, snowboarders rejoiced this week after locals-favorite Epic Mountain Resort formally banned skiing. Although the ban has only been in effect since Wednesday, riders have been astonished at the rapidly improving conditions on-and-off trail. Epic Mountain Snowboard Patroller Luke Wallace says he's never seen the mountain look this good. "The moguls were gone within 48 hours," Wallace told TGR. "I'm dumbfounded. For patrol, this is a big deal — we're expecting way fewer injuries now that half of our traffic aren't carving huge death mounds in the middle of every run." Local rider and self-described shredder Jones Fourpow, 24, said he was "stoked" about the skiing ban. "It's been so sick. So deeep — just the bros — PBR — blahhhhh..."
Here at Epic, we've given this whole 'skiing thing' a fair shot. Epic Mountain had been considering a skiing ban for the last several seasons due to trail congestion and the reoccurring mogul problem that had both locals and resort officials exasperated. 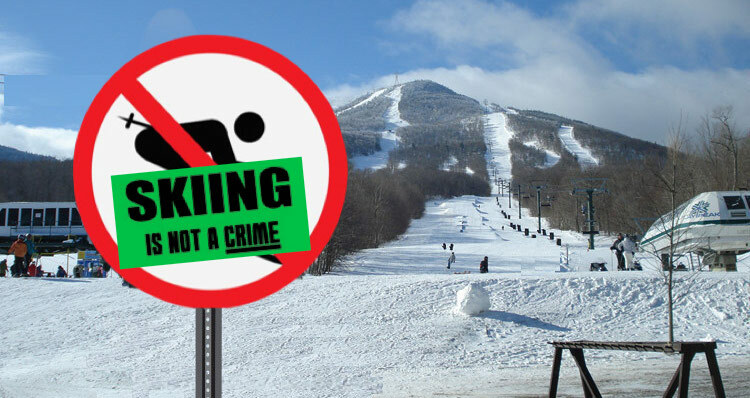 In a bluntly worded marketing statement, Epic Mountain PR specialist Elissa Taylor explained the resort's controversial ski ban. "Here at Epic, we've given this whole 'skiing thing' a fair shot," the statement reads. "But unfortunately, it's just not working out. Families have repeatedly complained, and as such, we've been forced to tell our skiing clientele to head elsewhere — like Alta, Mad River Glen or Deer Valley." Where is this resort located? Is this an early April fools joke? And where is that? Don’t find anything in an internet search. Traveling is something that broadens your mind. I’ ve visited many countries and seen many cities. But ski resorts are still a mystery. This also applies to writing skills, so I prefer <a>legally buying essay papers</a> . I think it’s the best solution in my case. As an Alta skier happy that snowboard riders aren’t allowed on the lifts, I see no reason that other resorts shouldn’t become exclusively snowboard zones. Just as Alta’s position doesn’t really curtail snowboarders’ options in any significant way, Epic’s new position doesn’t hurt skiers’ options in any but a trivial way either. Ok, ya got me. Doesn’t look like there is an “Epic Mountain Resort.” Still, who is to say some real area won’t follow suit? I don’t think that it would be a great idea to ban skiing when the trails are looking so good this year. Moguls are indeed a concerning issue on every trail but I don’t think that you should be banning it because of this simple reason. No moguls because all of the snow has been scraped to the bottom of the hill.